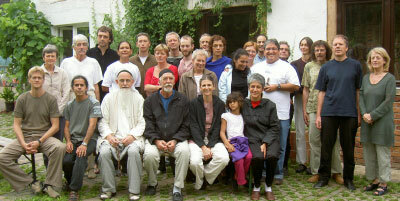 This year the German seminar was held at the Sufi Zentrum Osmanische Herberge in Kall-S�tenich. The experience of working inside a Sufi community added a special ingredient to our own work. We had the chance of participating in some of their activities and had the opportunity to meet with Sufi Master Sheikh Nazim Adil al Haqqani of the Naqshbandi Order-, which was a wonderful experience for us. We were treated as if we belonged to the family and Scheikh Hassan Dyck, the Head Sheik of the Sufi community, provided a wonderful atmosphere of warmth and generosity that helped us greatly to understand the main theme of our seminar which was relationships. Each day was dedicated to a different aspect of our practical everyday life, first parents; second us as parents and thirdly our personal relationship. It was obvious from the very beginning that we were in front of one aspect of our life that needed great attention. Movement�s classes were very intensive and we dedicated more than 5 hours a day to practice and learning various movements of the Gurdjieff tradition. They seem to provide the fuel that allowed us to have a more impartial look at our lives. We all became aware of the need for change and also saw the possibility and the means to accomplish them. The Zikr at the end of each day gave us the assurance of not being alone in our endeavor. That there was help available and the channel to open the possibility is Love.